Nobody really needs an excuse to drink margaritas and eat enchiladas. But if you did, Cinco de Mayo would be it. The fifth of May is a holiday that celebrates Mexico’s defeat of French colonists who were trying to expand into Mexico. It has its importance in Mexico, yes, but is widely celebrated here in the U.S. where drinking margaritas and eating Tex-Mex foods is the center of most activities. Other popular Mexican foods include guacamole, tacos, tortillas, burittos, and churros. I enjoy eating any or all of them, but recipes for those can be found in abundance at many food-related sites, and often include (non)healthy doses of fat and calories. I wanted to prepare an entree that would be healthy, colorful and speak Mexican, while keeping the fat in check. So stuffed peppers it is, with a nod to Cinco de Mayo. They are muy Mexican and delicioso!! 1. Preheat the oven to 350*F. Lightly spray a baking dish with non-stick spray. Clean and prepare the peppers. Slice in half vertically, removing all ribs and seeds. Set aside. Note: You may wish to leave the peppers whole for stuffing. I like to cut mine in half so I get more stuffing–for me, it’s all about the stuffing and not so much the pepper. Peppers halved and prepared for stuffing. 2. Cook the beef: In a large skillet heated to medium-high, crumble the beef and cook until no longer pink. Near the end of its cooking time add the onions and sauté a bit longer till they soften. Drain any drippings. Browning the beef and onions. 4. Fill the pepper halves so the filling is slightly mounded at the top. Place in a baking dish close together so they support each other. Pour the 1/2 cup water around them. Cover with foil and bake until they are tender, about 1 hour and 15 minutes. 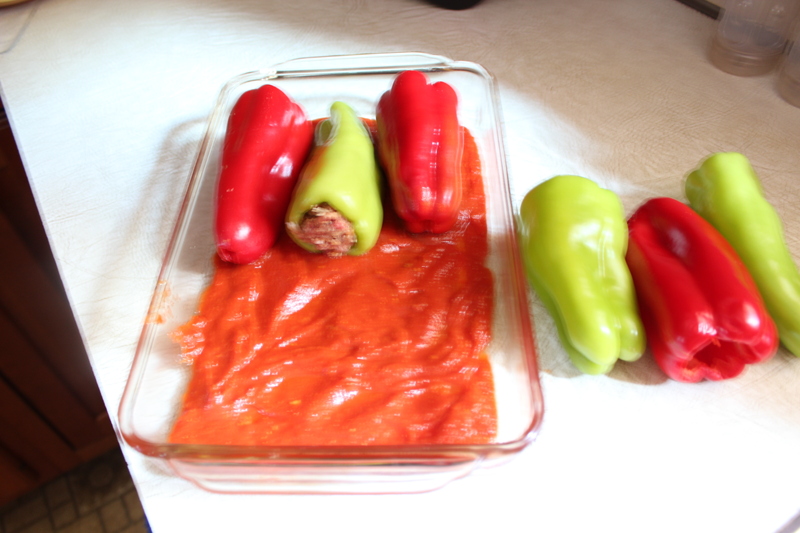 If you like to use cooking bags, place the peppers in a bag and bake for about the same length of time. 5. When the peppers are tender, remove any covering, sprinkle with remaining 1/2 cup cheese, and return to oven to melt cheese. Sprinkle with cilantro before serving. 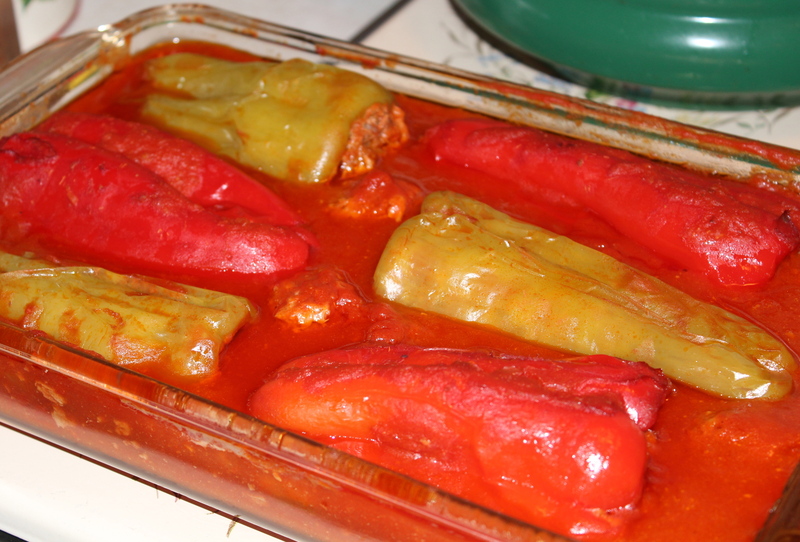 One day about a year or so ago I was watching Lidia’s Kitchen on Public Television, and on that day she made several dishes all featuring cubanelle peppers. 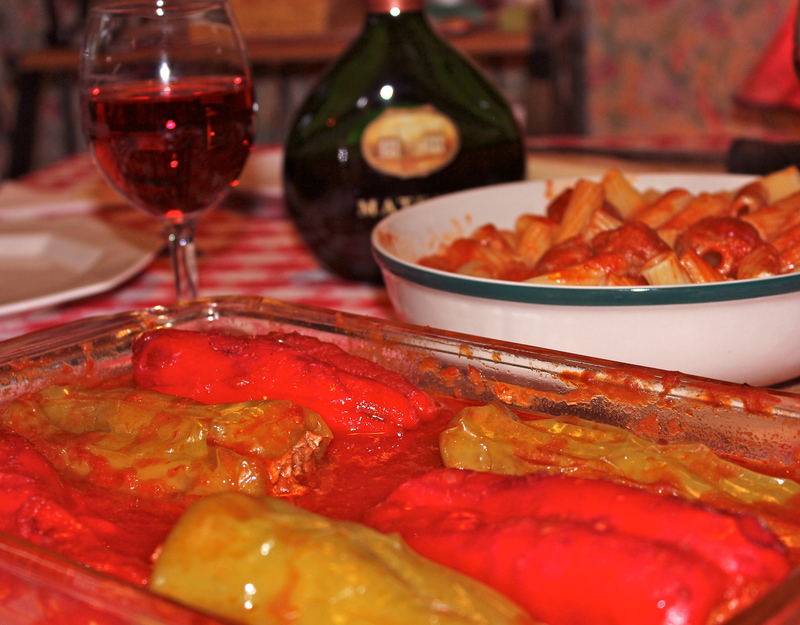 One of those dishes was the stuffed peppers I have for you here. Although I did not take notes as I watched I remembered basically what she did. I must point out that this is my adaptation of her recipe since I did not get exact amounts of ingredients. Given the fact that these peppers are readily available at this time of year, I tend to make this when they are abundant. Cubanelle peppers, also known as Italian frying peppers, are not what you usually think of when you want to make stuffed peppers. Usually the bell pepper is what comes to mind. 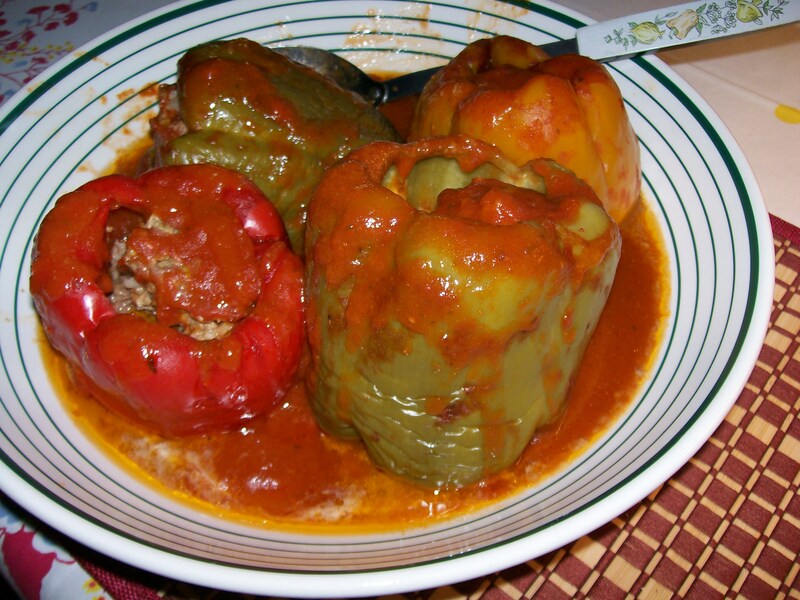 In a previous post I presented my recipe for Homestyle Stuffed Peppers, using bell peppers,and promised then that I would tell you of my other recipe for stuffed peppers. So this is it. I like these particularly well because the skins are very thin, and the flesh surprisingly meaty. ; they also bake in their sauce in about 90 minutes. I like to serve them with a pasta; one shaped to hold the sauce well. In this case I used a ribbed rigatoni. A tossed salad completed the meal. Oh, yes, a glass of red wine, too. 1. Prepare the peppers: cut off tops, remove bulk of seeds and carefully remove the ribs with your fingers, taking care not to crack or break the pepper. In the bottom of each pepper, cut a small hole. This lets the meat juices escape and the sauce to enter. 2. 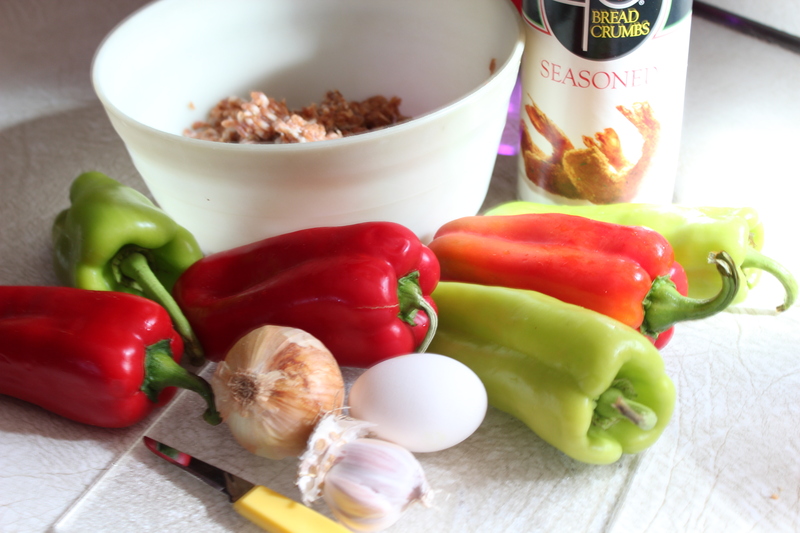 Prepare the meat filling: In a large bowl, combine the sausage, ground beef, egg,bread crumbs, minced onion and garlic. Sprinkle with salt and pepper to taste. 3. Using a tablespoon, put meat filling into the peppers, pushing down gently with the spoon or tapping the pepper gently on the counter . Take care not to pack the meat too tightly. It needs room to expand so the filling will be tender. 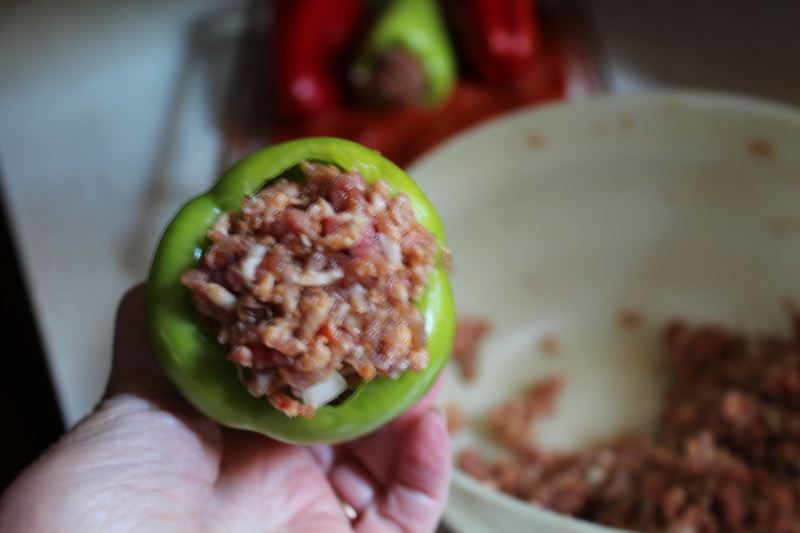 If you have meat filling left over after stuffing the peppers, form it into small meat balls. These can be tucked in around the peppers. 4. Spray a baking dish with non-stick spray; one that is large enough to hold the peppers and the sauce. Pour enough sauce in the dish to cover the bottom. Lay the stuffed peppers on the sauce (and any meatballs). Pour the remaining sauce over all. 5. Cover with foil and bake at 350 degrees for 1 hour and 1/2. The smell of these cooking is so wonderful it will make you hungry. In the last half hour of cooking time, boil water and cook pasta. Serve with the sauce spooned over the pasta with grated Parmesano-Reggiano cheese on top. 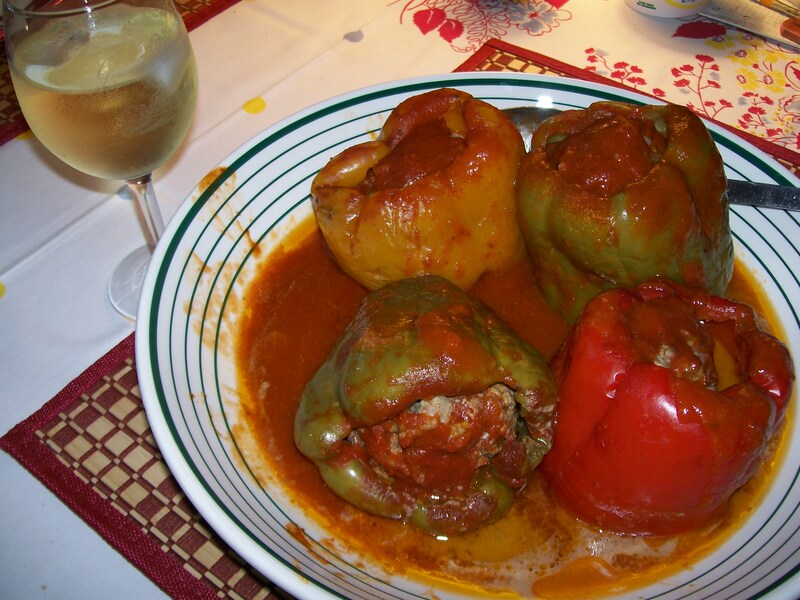 I have two different ways that I prepare Stuffed Peppers; one kind is made using Cubanelle or frying peppers, and this way using the more familiar Bell peppers. This is the classic recipe my mother always made which I grew up on. 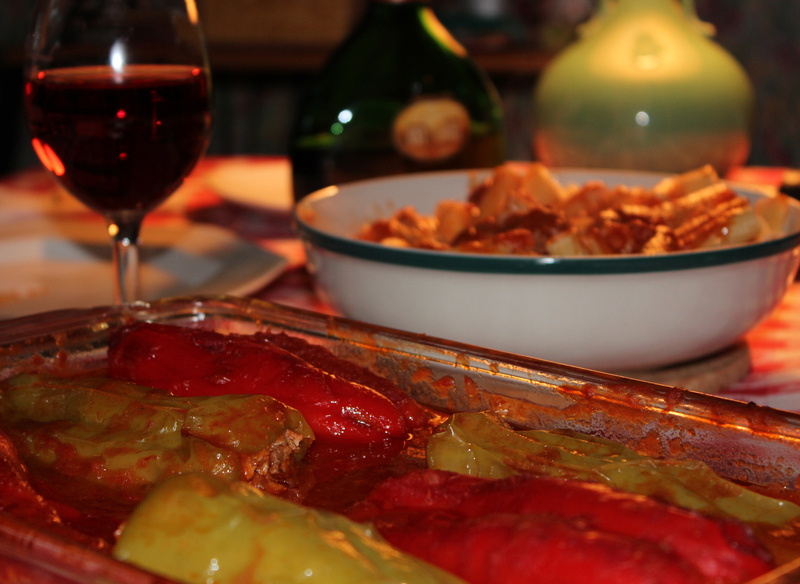 At another time I will share with you my recipe for the stuffed frying peppers. 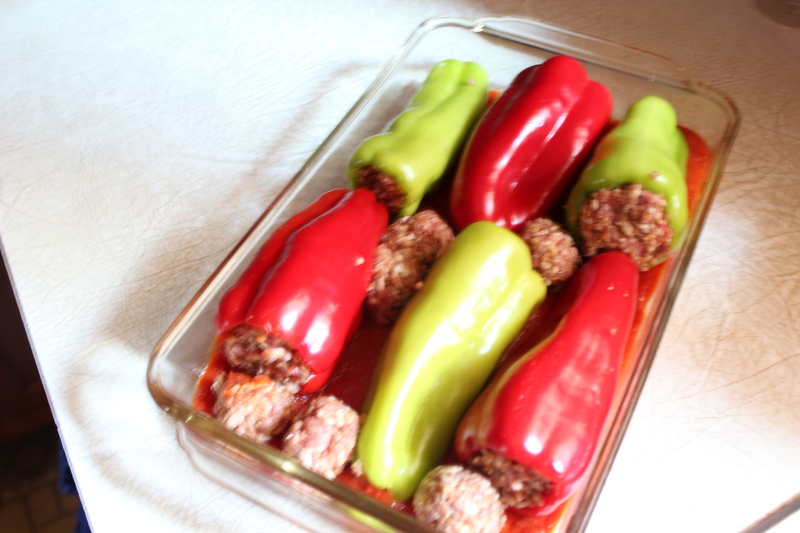 Peppers in any color combination–green, red, yellow, orange–are stuffed with a mixture of seasoned ground beef and rice then covered in a tomato sauce and baked until tender. Sometimes I serve them with pasta such as rotini to soak up the sauce, or I might serve them with mashed potatoes and another vegetable like carrots. It makes a very colorful plate. 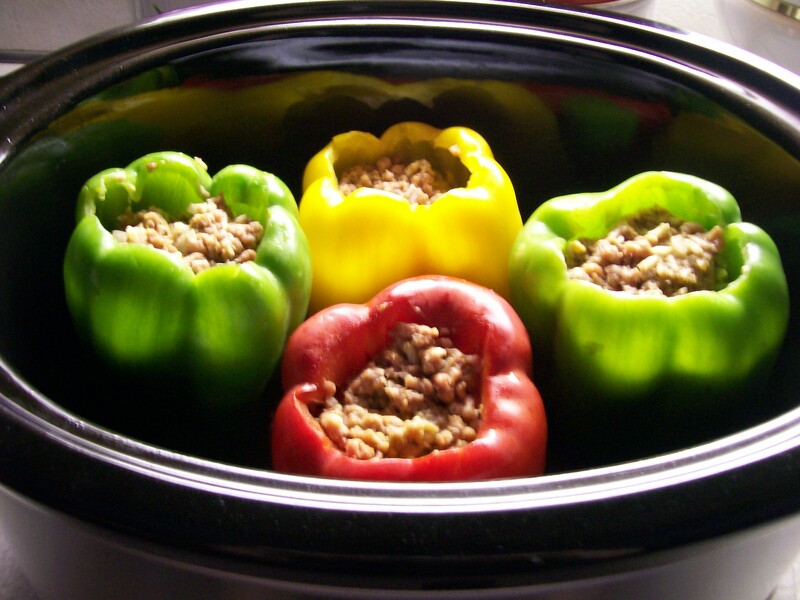 The peppers may be oven baked or cooked in a slow cooker. 4 nicely shaped bell peppers, tops, seeds and membranes removed. Bring a large pot of water to a boil. Cook the peppers in boiling water for 4-5 minutes. 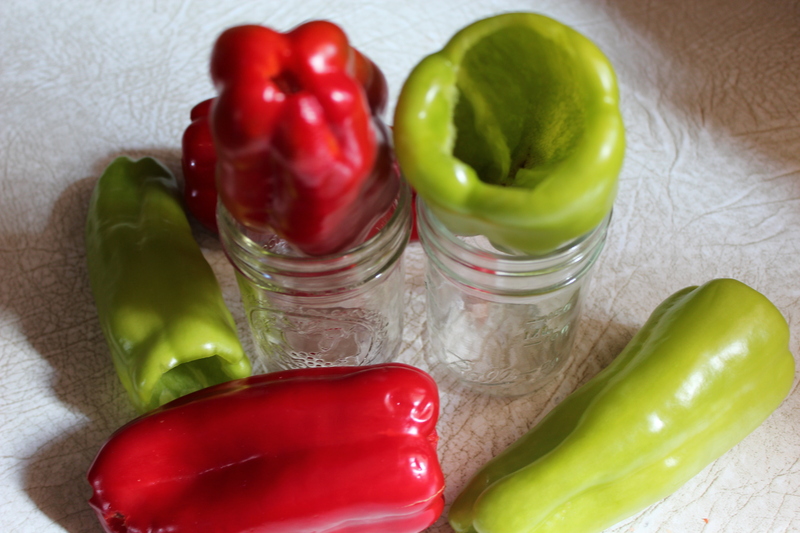 Remove the peppers, rinse with cold water, and set aside to drain. Mix together ground beef, cooked rice, egg, chopped onion, bread crumbs, salt, black pepper, garlic powder, and 1/4 cup parmesan cheese in a large bowl. Combine well. 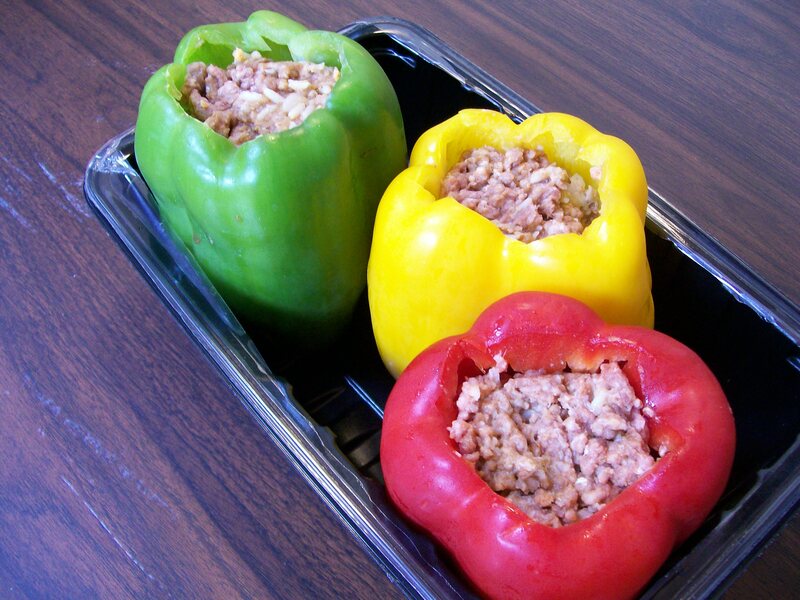 Divide beef and rice mixture evenly among the peppers, taking care not to pack too tightly. 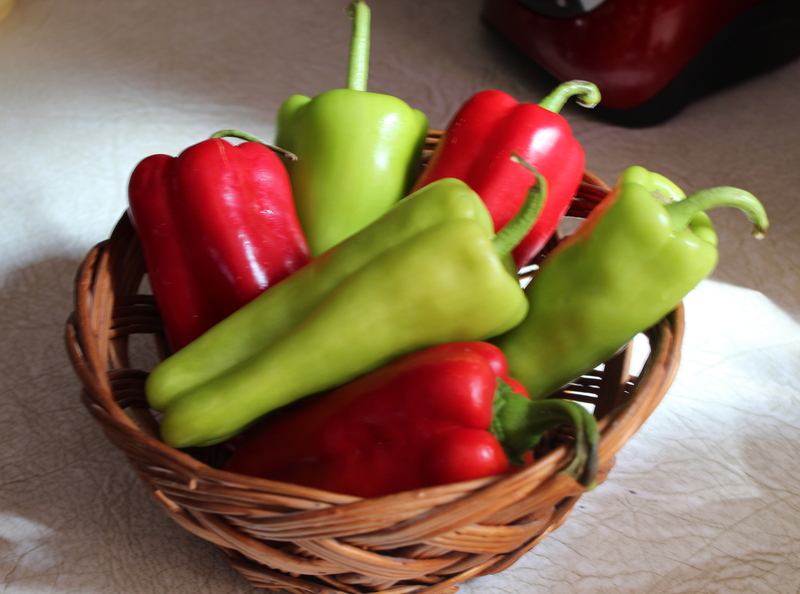 Place peppers standing up in a baking dish or shallow roasting pan. It’s best if they fit rather snugly so they can support each other. Pour the tomato sauce over all. Bake in the preheated oven until tender, basting with the tomato sauce several times while baking, about 1 hour and 20 minutes. 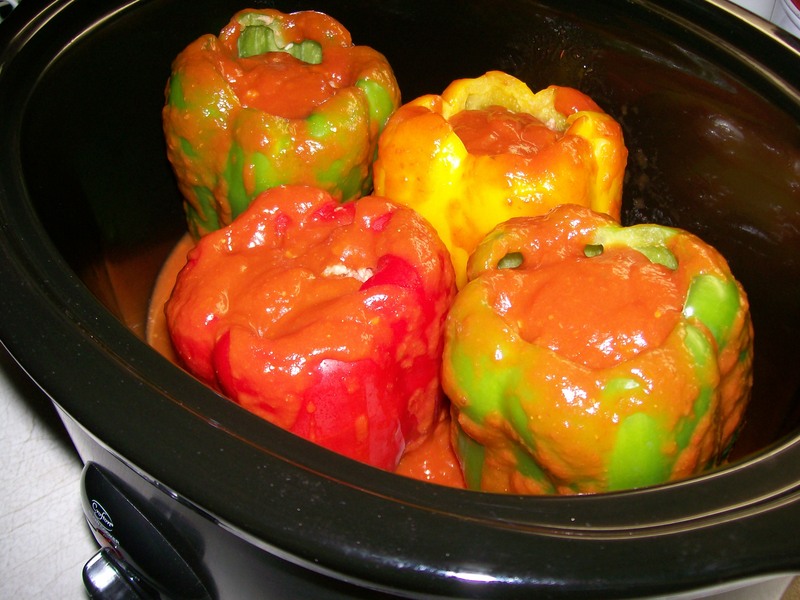 Alternately, place peppers standing up in a slow cooker, pour sauce over all, and cook on LOW 6-8 hours.